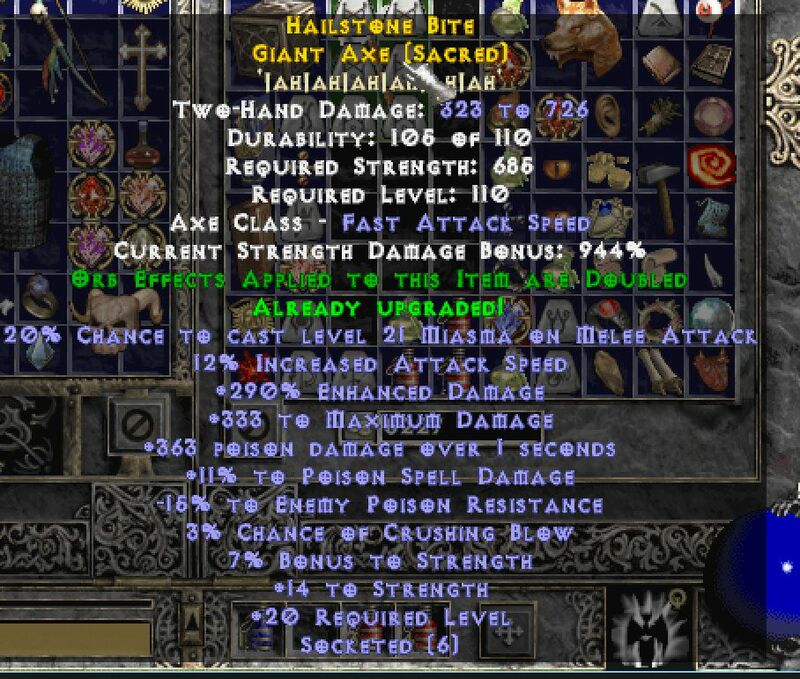 thedarkbobo wrote: Another question for late gamers - would you use Great Axe? Highest dmg base possible. Also I am thinking of doing some Xis rw's - anyone running with Rebel or Dawn? highest damage doesn't always get priority if it's too slow to hit your breakpoints. I think Giant Axe is the highest damage anyways for 2h axes (non-barb)? Yes Giant my mistake, how would I calculate that in tree form? I am using such at the moment and it seems fast. However I just did not roll anything better with on striking/on kill procs yet. Edited by thedarkbobo 7 months. Im not sure why you settled for an on-attack proc and MO'd life on attack if you're doing thorn strike, since it's not a melee attack. it's a ranged missile weapon attack basically. unless you're doing wildfire? Aero wrote: Im not sure why you settled for an on-attack proc and MO'd life on attack if you're doing thorn strike, since it's not a melee attack. it's a ranged missile weapon attack basically. unless you're doing wildfire? Now I am thinking one could go for Dawn(100% bonus to all attributes) in war axe and craft 2% block 5-10% DR dex/str shield and have around 30-40% block without much effort (I am at 20% without putting many points in dex - maybe 100). 50% would require dex crafts I guess, but would bring us at least on par with Melee sorc in terms of defs. Or Shark in Giant Axe for physical damage, but not sure it's worth compared to a craft. From my current tree point of view Epicenter boots could be good - max life +31-40%(this would get me to around 20k), though I would loose around 300 str as I use Steppe Sleeper set boots 38% Str bonus. Muilpeer wrote: ANy other tips on how to keep my merc alive are welcome too Maybe some teleport on struck items? I've heard they can keep a merc alive too. What's the reasoning behind icarus over kali? Roenan wrote: What's the reasoning behind icarus over kali?